The Zetas have been asked to address migration patterns after the Pole Shift, as the seas rise to 675 feet above their current level. As the populace becomes more and more aware of ZetaTalk accuracy, these migration routes are likely to become active well before the Pole Shift. What countries will be most affected, and what direction will the drowning populace take? The UK will be affected not only by the sea level rise but also by being pulled down as the Atlantic Rift is pulled apart. Scotland and Wales have high land that will remain for the most part above the waves. Other parts of the UK will be devastated. Per the Zetas, who were asked recently about Gibraltar, the elite may attempt a quick hop to Africa via this route. Gibraltar maintains regular flight connections to London and Manchester. Budget airline EasyJet also flies to Liverpool. ZetaTalk Analysis 9/7/2013: It is notable that Britain has airline service from the UK to Gibraltar, under the auspices of tourism. This well established route will be used extensively when the realization of the flooding in the UK’s future grows. Brits, especially those with funds, will be looking to avoid passport issues and the crowded water ways by a direct flight to Gibraltar, then on to Africa if not by boat, then by air. Thus, they are literally on the African coast, or so they assume. ZetaTalk Prediction 9/7/2013: The UK must deal with potential tsunami as the North Atlantic pulls apart. The UK will also be pulled down, more on the west side than the east, due to lack of support from drooping Atlantic plates. Then there is the global rise in sea level by 675 feet, worldwide, within two years after the Pole Shift. 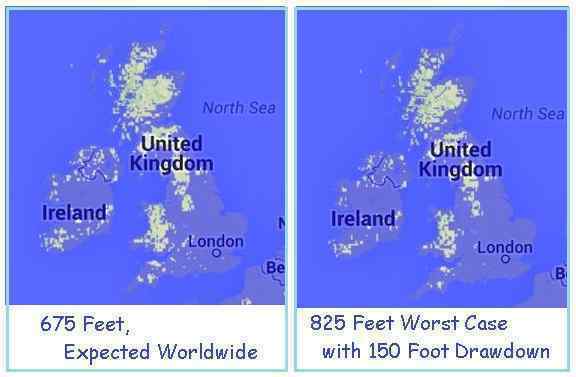 Since Scotland and Wales will have land mass above the waves, while most of Britain and Ireland are flooded, they should prepare to offer rescue to their countrymen. 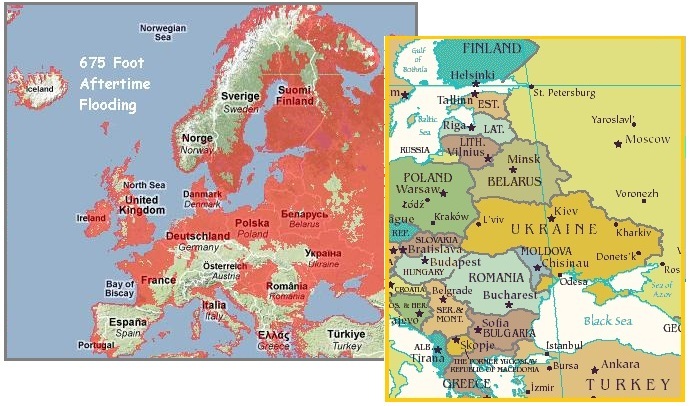 Much of Europe is coastal lowlands, and will gradually flood. Their populace must either take to boats, houseboat living, or migrate to Norway and Sweden or into the Alps or highlands of Spain. Just what rules will be established to control such migrations is unknown at the current time, though the Zetas have indicated Russia does not want European immigrants trudging through Russia toward the highlands of East Russia and Kazakhstan. They will have their hands full with their own drowning citizens. ZetaTalk Prediction 2001: Europe will be a series of islands in the Aftertime. Europe is a land of coastlines, already. Fortunately for the survivors, travel by boat will not be that difficult. The climate will be almost ideal, access to the sea at hand, and boat building and fishing a skill in many European countries. ZetaTalk Prediction 2001: Of course Norway and Sweden are seen as desirable countries to immigrate to as they are high ground, social democracies that take care of their citizens, and in the case of Norway, wealthy. One should not expect their immigration policies to change. There will of course be huge numbers of migrating people from western Russia, Demark, Finland, and the lowlands of Poland and Germany and other lowland countries. They have few choices. ZetaTalk Prediction 6/1/2013: The Ukraine is on the edge where some of its land will be above the waves, but all to the east in Russia will be flooded. 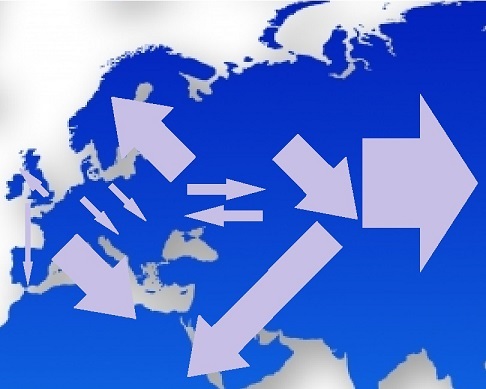 Migration will flow in two directions, first from the flooding lands in Russia to high ground in the Ukraine, and then as Europe is likewise afflicted with flooding, back toward Russia in the desperate search for a land route to high ground. Russia does not want Europeans bridging over to Kazakhstan, which will already be burdened with migrates from Russia. Then there is the lure of Africa, which will be almost entirely above the waves in the Aftertime. Former colonies of European countries will be approached with friendly offers. S Africa is very much sought by the elite. And per the Zetas it is no accident that France was so eager to help Libya be free of Gaddafi. ZetaTalk Prediction 6/1/2013: Second comes the use of bargaining chips, such as between France and the new government in Libya which France assisted to be free of Gaddafi. France knows much of its land will flood, and Libya is right across the Mediterranean. Per the Zetas, Russia too has its eye on a partnership with African countries. Russia is after friendly relations and productive cooperation with all countries in Africa. President Vladimir Putin said this in a message to the Addis Ababa summit marking 50 years since the foundation of what is now the African Union. He also praised the Union’s role in conflict management, peacekeeping and advancing social and economic development across Africa. ZetaTalk Prediction 6/1/2013: By its firm partnership with Iran and Syria, Russia plans a firm handshake with Islamists throughout Africa. Russia has immense territory that will be flooded, though Eastern Russia will survive and have an excellent climate in the Aftertime, and is at present sparsely populated. Per the Zetas, Russia should plan accordingly, and begin migration early. ZetaTalk Prediction 2001: Russia suffers greatly due to the flooding that will occur after the pole shift. Most of the country lies beneath the 675 foot elevation where we estimate the waters will rise. The Ural Mountains clearly stand above this, as do the mountains of eastern Russia. The mountains of eastern Russia are sparsely populated, in Russian territory, and will have a delightful climate in the Aftertime. We advise an early migration to those regions, or a migration via boat if delayed. As with migration out of Europe and Russia, migration in Asia will be dominated by flooding issues. 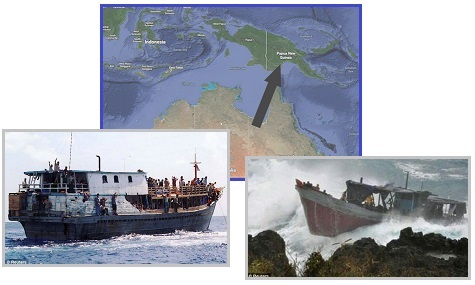 Well ahead of the Pole Shift the sinking of the Sunda Plate has caused Australia to take firm measures to block illegal immigration from Indonesia to Australia. Australia will have to think of re-settling their own citizens, as the western 2/3 of Australia will be pulled under during the Pole Shift. Australian Prime Minister Kevin Rudd has banned all illegal boat refugees from ever settling in the country. All new unauthorised asylum-seekers will be sent to Papua New Guinea under a regional resettlement deal, declaring future boat refugees will have 'no chance' of staying in Australia as refugees. In exchange for PNG's agreement, Australia will fund further aid initiatives. ZetaTalk Comment 7/9/2011: Australia is brutal to those among the poor who are desperately trying to climb onto Australian shores. The elite are welcome, but the poor can drown and starve. China likewise has taken a firm stance against drowning refugees from the South clamoring into China. It is no secret that China has developed Ghost Cities in their interior, as yet unpopulated. If one takes careful note, these Ghost Cities are far away from India (which will become the new S Pole) and also along a curve of land destined to be above the sea level rise of 675 feet after the Pole Shift. China has taken note of ZetaTalk! ZetaTalk Comment 7/23/2011: The ghost cities of China are situated where the climate and elevation will be most optimal in the Aftertime. China can be expected to direct its population to migrate within China to the desert regions in the interior. Certainly, any refugees from other countries will be harshly ejected, with guarding the borders a top priority. Nor will the elite from other countries be welcomed. China is also firmly guarding her southern borders along SE Asia and above India in Tibet. Migrants may come to those borders, but will be blocked and turned around. China, after all, does have populous cities along its coastline, and those provinces bordering India which will suddenly freeze, to consider. They will relocate and take care of their own. From the territorial disputes with Vietnam and the Philippines in the South China Sea to tensions with Burma (Myanmar) and Thailand, relationships that were sound, if not always friendly, have now soured. ZetaTalk Comment 11/5/2011: China does not want her neighbors to the south to migrate north. ZetaTalk Comment 1/21/2012: China considers Nepal to belong to the Chinese government, and we have already stated that they have plans to block the populace trying to escape flooding countries. India, and those countries sharing the northern part of the Indo-Australian Plate, are already sinking steadily, and have only more horrors to anticipate. The Zetas have advised them to take to boats and head to Africa, which is relatively under-populated. They will likely, in any case, be in boats as the flooding exacerbates. ZetaTalk Comment 6/16/2012: Boat cultures, floating cities of desperate refugees with nowhere to go, will become common in SE Asia and India. 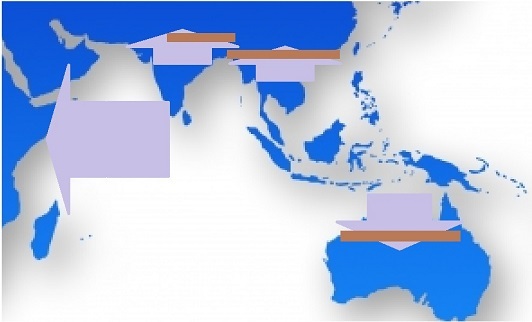 India and other lands on the Indo-Australian Plate being pushed down will find their sinking lands steadily worsening. ZetaTalk Prediction 11/5/2011: Africa today has a large Indian population in those countries bordering the Indian Ocean, and the coastlines are scarcely secured by these poor nations. Illegal immigration has a long history in the world, the techniques well known. Those standing in water, with no hope of a different future, will migrate to dryer land and a better future. Cargo ships will be diverted from their usual cargo to a more profitable cargo - desperate refugees. 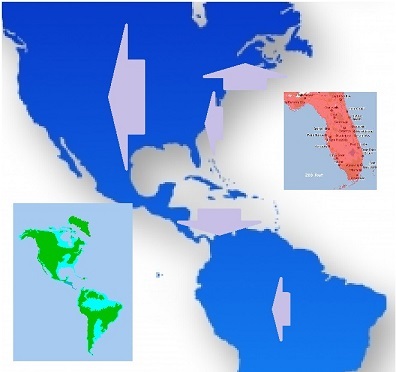 In the Americas, the great flooding that will occur as a result of the 675 sea level rise will occur in the main within countries, where migration will not be blocked but will perhaps be directed. Canada floods from the North, which is relatively unpopulated. In the continental US, the Mississippi basin will flood, leaving only an island at the Ozark Mountains. Most of the populace west of the Mississippi would head toward the Rockies and Sierras, the mountains along the Continental Divide. This would be encouraged by the devastation from the coming New Madrid disaster, leaving lands along the Mississippi and in the Eastern US dealing with refugees and not putting out the welcome mat. Along the East Coast of the US, coastal areas will find drowning citizens scampering up into the Appalachian Mountains. The Zetas have also predicted that the heavily populated cities along the East Coast will migrate past New England into Quebec, where they will be loud mouthed and demanding - uninvited guests. ZetaTalk Prediction 2001: The Appalachian mountains will be above the water line when all is said and done during this next pole shift, including the melting of the poles that will raise the oceans some 650-700 feet within a couple years after the shift. Where relatively isolated now, those living in these mountains will find themselves increasingly crowded with survivors who will be forced to move inland to escape the rising waters. ZetaTalk Prediction 2001: The greatest concern that Quebec will have after the shift will be migrating survivor from the population centers of eastern half of the US. Crowded up into the Appalachian Mountains and into the limited land mass that the New England area provides, they will be as likely to push into Quebec as toward what were the western states of the US, seeking land that would have been high enough to remain dry land. Those struggling to survive in the sinking and crumbling Caribbean islands and Central American lands will look to the high lands of S America, per the Zetas, as lands to the North will have their own flooding shorelines. ZetaTalk Prediction 2001: Colombia will stand as the high ground that frantic survivors in Central America will scramble toward during the shift. As Panama is the point where water today flows between the Pacific and the Caribbean, this is bridge to safety that will wash out early during the hour of the shift. However, any survivors clinging to floating material will wash up on Columbia's shores, wanting rescue to be fed and housed. Increasingly frequent and violent earthquakes and volcanic activity are a sign of the stress the Earth plates are under from jerking during the daily wobble. Booms from snapping rock, odd vibrations, and on occasion a moaning or humming Earth are also signs. Planet X tugs the globe this way and that, so stretch zones are stretched, subduction zones are under pressure, and rotting material trapped between rock layers releases methane gas. Birds and fish are very sensitive to methane gas, thus the canary in the coal mine to warn the miners of methane leaks, and thus the increasing fish kills around the world as this Pole Shift ning blog attests. 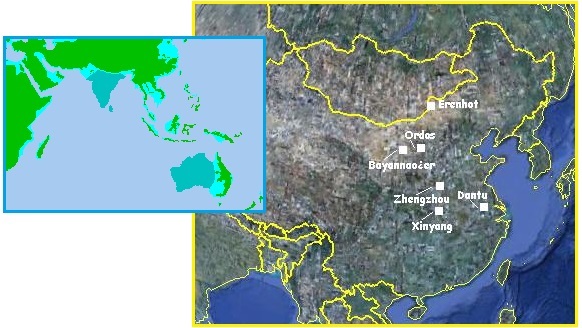 Recent examples are in Greece, China, and Rio. The desperate establishment, which must say something, usually has some excuse handy. Ten tonnes of dead fish have been found in a lake in the north of the country due to an inexplicably absence of oxygen in the water. 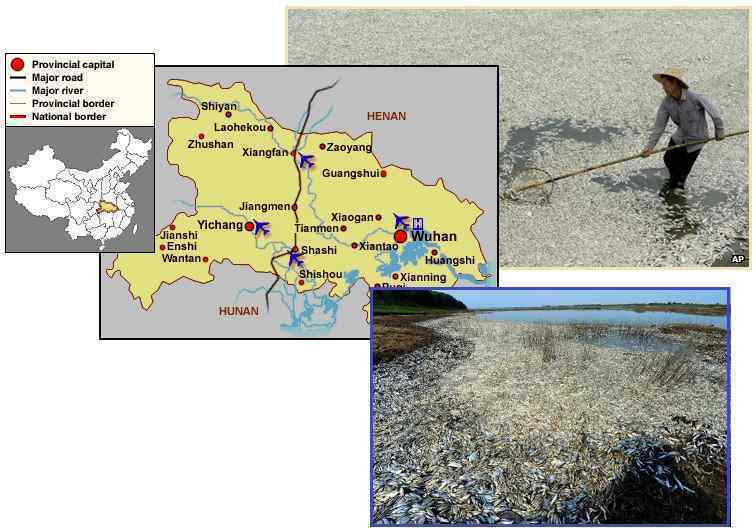 Chinese authorities have recovered about 100 tonnes (220,000lb) of poisoned fish from a river in central Hubei province. The fish died after a chemical factory discharged ammonia into the Fuhe river. Environmental officials blamed a nearby local firm for the incident. This latest industrial incident comes after more than 16,000 dead pigs were recovered earlier this year from a river that runs through Shanghai. Massive amounts of dead fish were found in a Rio de Janeiro lake next to the 2016 Olympic park, five months after thousands of dead fish were found at the site of 2016 Olympic rowing events. Biologists said the 10 tons of fish were probably killed due to raw sewage. ZetaTalk Comment 9/7/2013: What do an enclosed lake in Greece, an enclosed lake near Rio, and a river in China have in common? Though blamed on “an inexplicable absence of oxygen” in Greece, on raw sewage in Rio, and on ammonia in the water in China, these disparate cases have the same cause – methane released due to being in a stretch zone. The Eurasian Plate is stretched from Europe to China. The S American Plate is bowing such that the area near Rio is stretched. And in China the Hubei province is rift with deep rivers, which is a sign of thin crust at that point, the crust drooping from lack of support. Rock strata that is stretched to release methane trapped between rock layers, or drooping crust that tugs on surrounding rock are the cause. 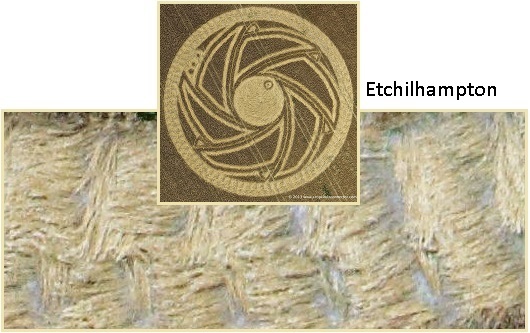 The 2013 crop circle season is coming to a close, but a couple obviously legitimate designs are notable by the way their grain is laid. These days, there are so many frauds, some even well done, but the legitimate circle makers have given clues, as the Zetas noted. Per the Zetas, West Kennett, laid on August 13, 2013 is depicting the Magnetic Trimesters once again. And the Etchilhampton Hill design, laid on August 19, 2013, is showing the retrograde effect that Planet X has on the other planets in the inner solar system and on the Sun itself. In early August, the Internet was abuzz with curiosity as to why the Sun had such a lopsided coronal hole. Per the Zetas, the hole was no larger in total area than in other years. But it was indeed lumped onto one side, in fact onto the side farthest from the Planet X presence. Now the circle makers have provided an explanation! ZetaTalk Insights 9/7/2013: Both these designs are legitimate, which can be seen by the woven grain laid in directions and in a manner that human frauds cannot accomplish. Westkennett was laid on August 13, a day after the August trimester reached its peak on August 12. This is shown by the dial just past the touch point at the bottom of the design. It has no other meaning than to emphasize the magnetic trimesters, which is a ZetaTalk concept and found only in ZetaTalk lore. During this past trimester change, earthquakes notably increased to the extent that LISS was taken down for weeks. Etchilhampton has a clear retrograde orbit flow pattern from the center - clockwise. This is the orbit direction of Planet X, aka Nibiru. But if viewed from the periphery, the counterclockwise direction of flow for the other planets in the solar system and the Sun itself is detected. What then are the three small planets clustered on the periphery? The Earth, Dark Twin, and Venus all normally sweep counterclockwise, propelled by the Sweeping Arms of the Sun. They are now all being pushed back by Planet X, and crowded together. The Sun itself is shown as centered on a vortex to its side, out of view of the Earth. The grain swirl pattern of the Sun is centered on this vortex. The lopsided coronal hole that appeared in 2013, lopsided compared to other years, is explained by the magnetic influence of Planet X pushing components in the inner Sun to the side and away from the magnetic presence of Planet X. Though overall the size of the coronal hole is no larger than in other years, the manner in which it is clustered to one side is different.